Right. 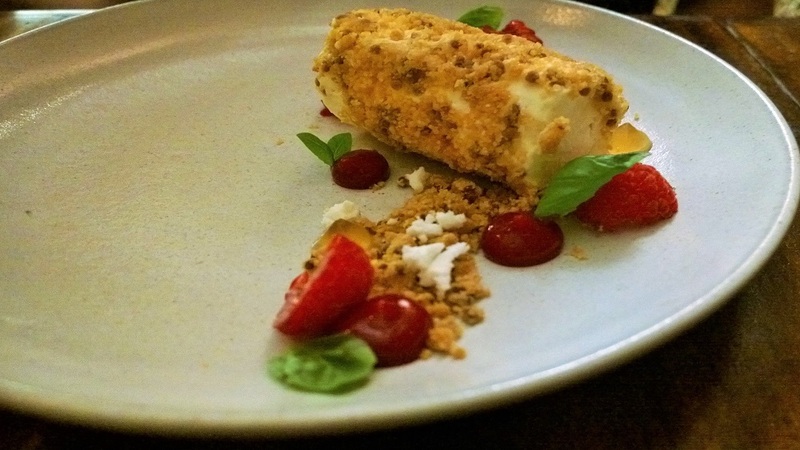 If your grandma plates up dishes like those at Maggie Joan’s, well, is she looking to adopt? I’d happily visit every day if I could dine like this. 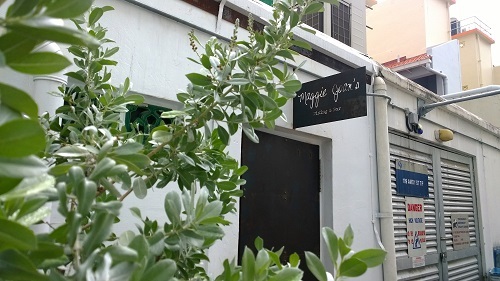 A double-barrelled moniker comprising the names of the co-owner’s grandmamas, Maggie Joan’s is the opposite of anything grandmotherly. 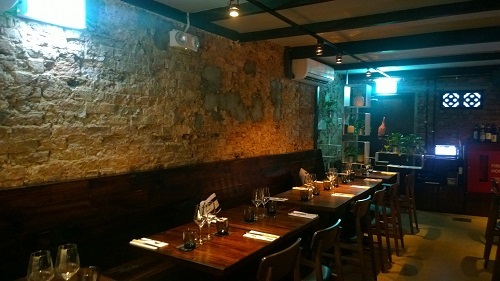 Launched by the father and son team behind Moosehead – another superb Mediterranean place, couple of streets down at Telok Ayer Street, this blink-and-you-miss-it spot, is located in a back alley, off Gemmill Lane. Basically, at the beginning of Club Street, make a left onto Gemmill Lane, walk down the short street, turn right and you’ll see the inconspicuous sign. Once you’re in, you’re warmly greeted by the staff, and despite the rather clandestine beginnings, you’ll find the ambience cosy and comfy. It’s nice to start off with an aperitif (there’s an extensive list of cocktails) and order up some bites to go with your drinks. The Egg, Saffron and Mayo ($6) sees a perfectly-poached egg, dusted with dukkah, a middle eastern spice mix featuring nuts, seeds and spices, usually cumin, coriander, hazelnuts and sesame. 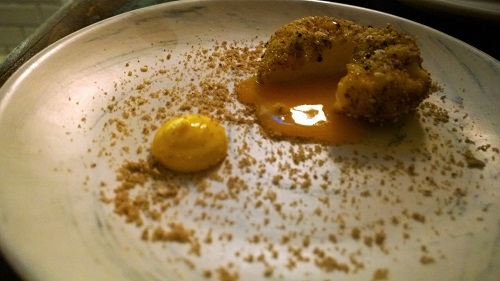 The saffron-coloured yolk oozes out seductively to meet the luscious little blob of saffron mayo on the plate. 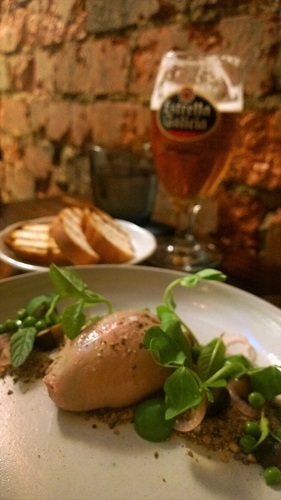 The Chicken Liver ($19) was my favourite dish of the night. Everything about the combination of the rich pate, with pickled mushrooms and accompanying “soil” that featured cocoa and mint, was perfect. 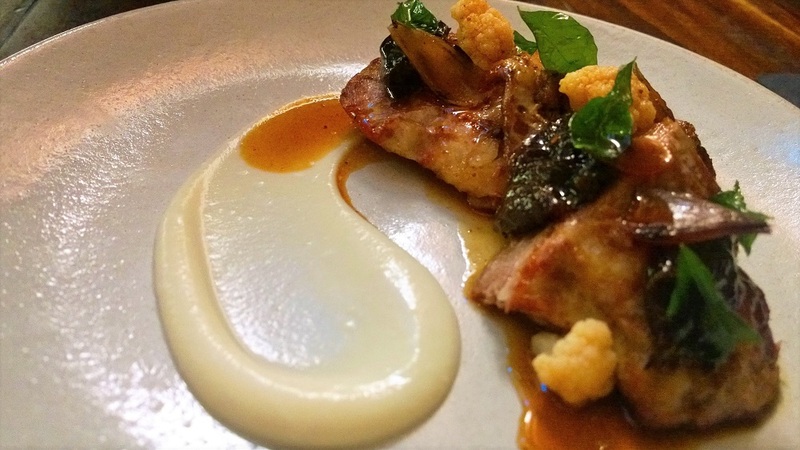 The other standout dish was the main that my partner had – the Grilled Iberico Pork ($36). Instead of the usual apple that accompanies pork, the sweet element for this dish came from prunes and it was just delicious. 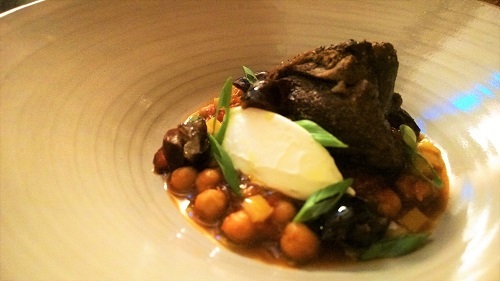 Now, I could imagine that my main, the Lamb Neck ($32), would have been fabulous, as the spiced marinade married well with the smoked yoghurt and chickpea stew but I’m afraid, on that night, the meat was not as tender as it could have been. But as I said, the taste was definitely there, so hopefully, this was just a one-off. (To the restaurant’s credit, the staff did acknowledge that the meat was supposed to be more tender, and gave us the option to change the dish. But as we wanted to save room for dessert, we took up the option of complimentary dessert instead). And might I just say – desserts were awesome. 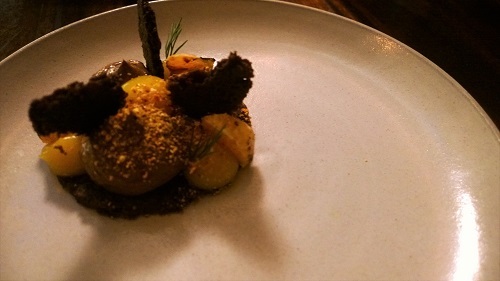 I went straight for the chocolate item on the menu and was rewarded with a gorgeously dark chocolate custard that was zinged up with orange and fennel. And whatever doubts we had about how heavy the Goat’s Cheese dessert might have been, was banished when we were presented with the dish. Like a rolled-up parfait and accompanied by muscatel and raspberries, it was light and refreshing and really, a perfect end to an almost-perfect meal. Noon to 2.30pm (Monday to Friday), 6 to 11pm (Monday to Saturday).